Father's day! A wonderful day to appreciate those around us who we love the most. Father's day can be an ideal time to get the little ones creative caps on. If you're stuck for fathers day gift ideas why not make something unique with your little ones? Art's and crafts can keep your child occupied for hours on end, creating something home made adds a personal touch to a Father's Day gift and one that can be saved as a keep sake from your little ones childhood. Your little one can be as creative as they wish to make the frame, think card board and ribbon. You can even create a photo frame from the age old craft trick, painted macaroni and glitter! A little messy but the end result is a personal, creative picture frame. Gather Dad's favourite images of the family and stick them inside the photo frame for him to hang pride of place. A classic idea would be to bake some lovely home made baked goodies for Dad. 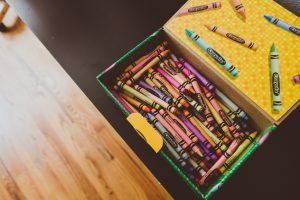 Go one step further and create a homemade cookie box or muffin holder and personalise it with your childs name, or even a picture of the family. If there is one thing you want Dad to do on Fathers day that is to have him relax! Creating a homemade coupon box creatives an alternative yet fun gift that can be used all year round. Use an old jam jar and get you little one to decorate it any way they like, think glitter, ribbon and paint! Then fill the jar with stars/hearts (whichever shape you prefer!) with coupons on for the year. Some good ideas would be "Make dad a cup of tea" or "Help Dad in the garden day"
Whatever gift you decide to give this Father's Day we hope you all have a wonderful day. If you have got any more craft ideas, feel free to get in touch we would love to hear you ideas.